Problem with above approach is either you will have to store the key in isolated storage or read it from some external sources. In major scenarios key is residing on the phone itself and it brings the flaw. 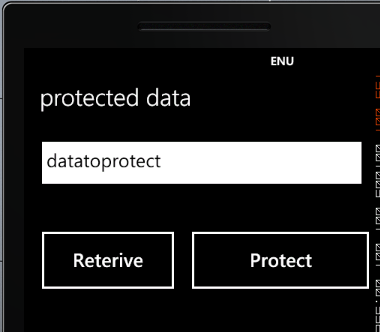 Windows Phone Data Protection API helps us to protect data at the application level. On Windows Phone 7 every application has their own key. This key gets created when you first run the application. Using DP API, all it takes one line of code to encrypt and decrypt the data. First line of code is converting string to byte array. To encrypt data only you need to pass byte array. Password is name of the file in which encrypted data is stored. All it takes only one line of code to decrypt. This is static class with two static methods. If required you can pass entropy as parameter also. Now let us design a page like below, Design is very simple with one text box taking input to protect the data. There are two buttons, one to protect data and another to decrypt and retrieve protected data. We are applying no entropy. Saving protected data to a file called password. We will have to fetch encrypted data from file password while retrieving. Writing byte array to file stream. We are first reading encrypted data from the isolated storage file. If you notice file name is same. Calling unprotect method and passing encrypted byte array to decrypt. Reading byte array to file stream. If you would have noticed we have not provided KEY either to ENCRYPT or DECRYPT the data. – Restore the data from the cloud. At this stage, the data cannot be decrypted, because the second time the app was installed and run, it gets a different key.